Again another new Prime Minister? Ever since the Ultraman King (Mega Monster Battle: Ultra Galaxy Legend The Movie) seiyu (voice actor) step down as the Prime Minister of Japan in September 2006, 4 persons have consistently failed and step down as the Prime Minister of Japan after just within 1 year holding the post. Note : I do not claim any rights on the above photos. All photo credits and rights belong to their respective owners. First thing first, the current Prime Minister of Japan, Yukio Hatoyama today announced his resignation. It seems to be very difficult to be the Prime Minister of the most advance and modern Asian country like Japan, the pressure seems to be enormous and if as we know, in politics, sometimes you do have to change your agenda for the sake of your political survival which in turns wont be popular for the common folks - the tax payer who demand so many nice things to happen and they want it fast. 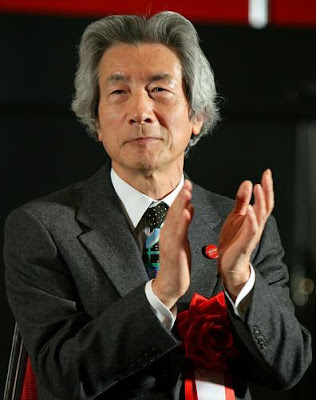 In case if you don't know why did I mentioned Ultraman King, I actually referring to the great Junichiro Koizumi (Koizumi Junichiro 小泉 純一郎 ) who in 2009 become the seiyu/voice actor of Ultraman King at the urging of his son Shinjiro Koizumi (Koizumi Shinjiro). Don't you think that's cool? How many of other ex-leaders (be it Prime Minister or President) of other countries have the chance (and willing to take it) to be the seiyu/voice actor of a popular TV super hero character? I don't think Hu Jintao, Wen Jiabao, Vladimir Putin or even George Bush want to be involved in the entertainment industry doing voice acting for Ultraman or any other local super heroes right? But in Japan and Mr. Koizumi make it happen successfully though I'm not sure how many of Ultraman series fan out there know about this. While on the other hand... as Prime Minister, there are too many things that you need to handle and decide... home/state policy, foreign policy, problem at hands, pending issue, political party agenda, national agenda plus your own personal/family problems... it's not easy isn't it? I wonder how Koizumi can lasted for long time, apparently he is one of the only PM so far to have served for more than 5 years since 1972 - you could consider him as the longest serving PM in the modern Japanese era. Click here to see the bigger version of it in Wikipedia. Who do you think is the most "handsome" or "good looking" amongst all 5 of them? So I wonder who will be the next Prime Minister for Japan.... Look forward for the announcement soon.... I also wonder how this will affect the political and economic outlook of Japan... and would this in any way affect the currency as well?